File photo, by Wendy Osher. At 10:46 a.m., firefighters in Nāpili and ocean safety personnel responded to a female body boarder 300 yards offshore and having trouble making it back to shore at Nāpili Bay. A standup paddle boarder assisted the 37-year-old female visitor from California to shore before fire and ocean safety personnel arrived. 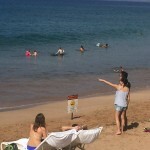 Large surf in the 4-6 foot range and a strong current prevented her from making progress to shore. No medical attention was needed. At 12:03 p.m., Nāpili firefighters responded to the surf spot, “Windmills”, about a mile north of Honolua Bay. A 19-year-old male resident of Nāpili injured his leg while surfing the break reportedly in the 12 foot range. An ocean safety rescue watercraft retrieved the man, who was being assisted by other surfers outside of the impact zone. 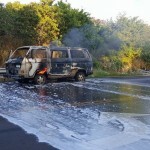 The surfer was taken to the old launch ramp at Honolua Bay where he was carried onto a fire vehicle and driven to the highway. Paramedics transported him to Maui Memorial Medical Center in stable condition. At 12:23 p.m., Lahaina firefighters responded to a body boarder having trouble making it back to shore at 3975 Lower Honoapiʻilani Road, about a quarter mile south of “S-Turns” in Kahana. An ocean safety watercraft picked up the 70-year-old male visitor from Washington State and brought him to shore. The man had been struggling for about an hour to swim back to shore but was hindered by the 5-6 foot surf and strong currents. He was seen by medics but declined transport. At 12:44 p.m., Firefighters in Kahului responded to a possible missing surfer at the surf break known as “Pier 1”, on the east side of Kahului Harbor. An ocean safety watercraft found a broken surfboard in the area and ended up finding and assisting another surfer to shore. That person reported seeing an injured surfer being taken in by a private jet ski. Crews eventually found the injured Makawao man walking back on the harbor access road. He had sustained facial injuries but elected to drive himself to the hospital. At 3 p.m., Nāpili firefighters responded to 3901 Lower Honoapiʻilani Road for reports of two swimmers in distress about a quarter mile south of “S-Turns”, in Kahana. Ocean safety watercraft picked up a 38-year-old male and 33-year-old female couple visiting from Minnesota and brought them back to shore. They were about 100 yards offshore and could not overcome the strong currents pulling them out to sea. They did not require medical attention. At 3:20 p.m., The Nāpili crew responded from the last ocean rescue to yet another at Nāpili Bay for pair of swimmers in distress. A male and female in their late 30’s were caught in the current and could not make it back in. An ocean safety watercraft brought the visiting couple from San Francisco back to shore, where they declined medical attention. Initially, the female was the one having difficulty swimming in, but when her male friend swam out to help her, both ended up needing assistance to shore. 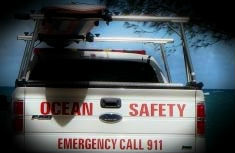 Ocean safety personnel from Kāʻanapali, Kapalua, and Kanaha responded along with firefighters from Nāpili, Lahaina, and Kahului to the ocean incidents.